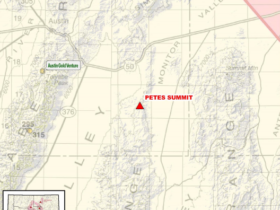 Petes Summit Project is located at the north end of the Toquima Range approximately twenty miles southeast of Austin, Nevada. US Highway 50 is approximately eight miles north of the project. The project is most easily accessed via Big Smoky Valley from the west. Elevations at the project range from 5800 to 7500 feet (1768- 2286 m). Carlin-type disseminated gold, hosted by the Roberts Mountains Formation. Previous work at the project included a few prospect pits and one drill hole, thought to be for barite, drilled in the 1970’s or 1980’s. 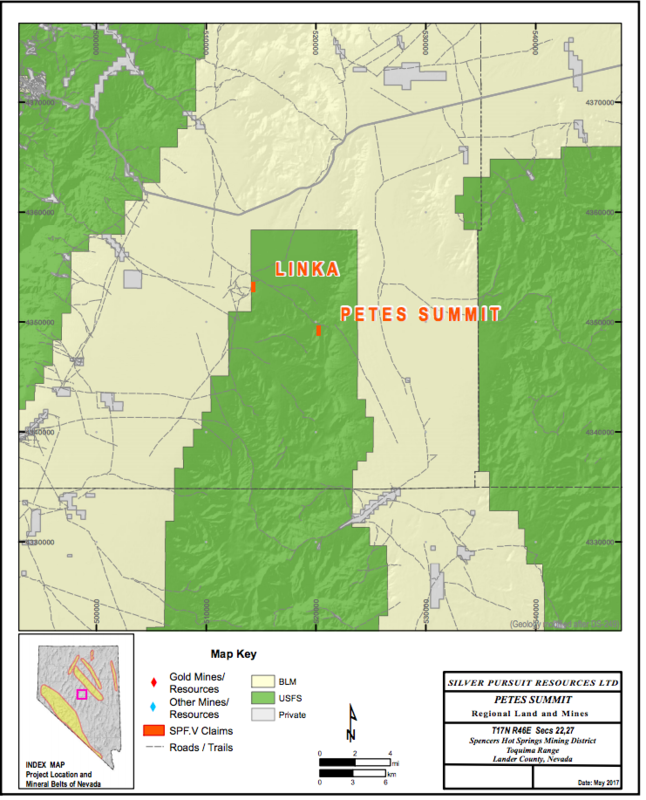 Columbus Gold located claims in the project area in 2005 and began geologic mapping and rock-chip sampling. 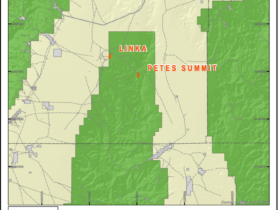 Petes Summit and two other properties were put into joint-venture in 2007 between Columbus Gold and Sniper Resources. Sniper then continued the exploration program including mapping and sampling. In 2013, Columbus completed eight reverse-circulation based on geochemical anomalies from a float-chip, grid-sampling survey. 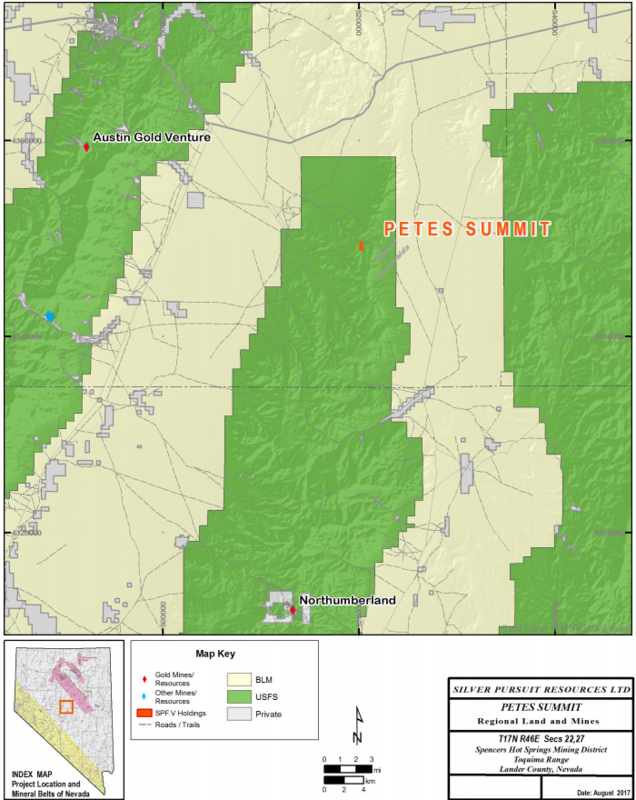 A total of 474 surface samples were collected from the surface at the Petes Summit project. This includes 225 float-chip samples (40m x 100m grid) and 249 rock chip samples. Samples were submitted for multi-element analysis and highest values of gold, arsenic, antimony and mercury are 354 ppb, 2960 ppm, 1600 ppm and 26 ppm, respectively. The results of the rock-chip sampling indicate that a Carlin-type geochemical signature is present at the claims. Grid-sampling focused on an exposure of Roberts Mountains Formation (host rock at the original Carlin gold deposit) that exists as a window in the Roberts Mountains thrust. Other rock chip sampling completed during mapping resulted in recognition of several geochemically anomalous samples described as upper plate map units. These may represent “upper plate leakage” along deep-seated structures that penetrate the Roberts Mountain thrust fault and the overthrust formations. 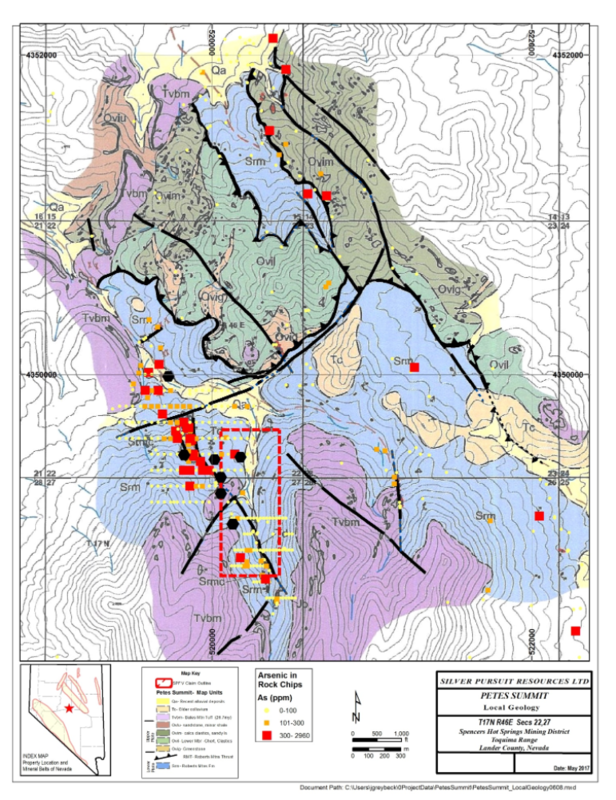 The target, tested by Columbus Gold’s drilling is a north-westerly trending, arsenic anomaly approximately 6000 feet in strike length and bounded by volcanic cover to the west and south. The best gold value in the grid sampling is 0.173 g/t Au. In all samples (rocks), the highest geochemical values include gold, arsenic, antimony and mercury at 0.354 ppm, 2960 ppm, 1600 ppm and 26 ppm, respectively. Results of Columbus Gold drilling are poor. The best gold value over a 5-foot drill interval is 0.048 g/t; this value is associated with strongly elevated arsenic, as well as anomalous Mo and Sb. The best surface gold value was not directly tested by drilling; the nearest hole is approximately 1300 feet north from this surface sample. The geologic setting at the project is similar to the original Carlin discovery where favorable lower-plate rocks of the Roberts Mountains thrust fault are exposed in a window through siliceous, upper-plate rocks. 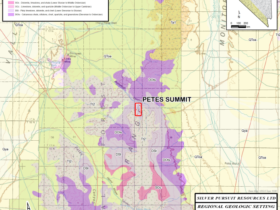 The target rock unit at Petes Summit project is the Roberts Mountains Formation, a platy limestone with more silt-rich interbeds present locally. The upper plate rocks are correlated with the Ordovician Vinini Formation. Altered Tertiary dikes are present at the project and are spatially associated with elevated concentrations of trace elements commonly associated with Carlin-type gold deposits. 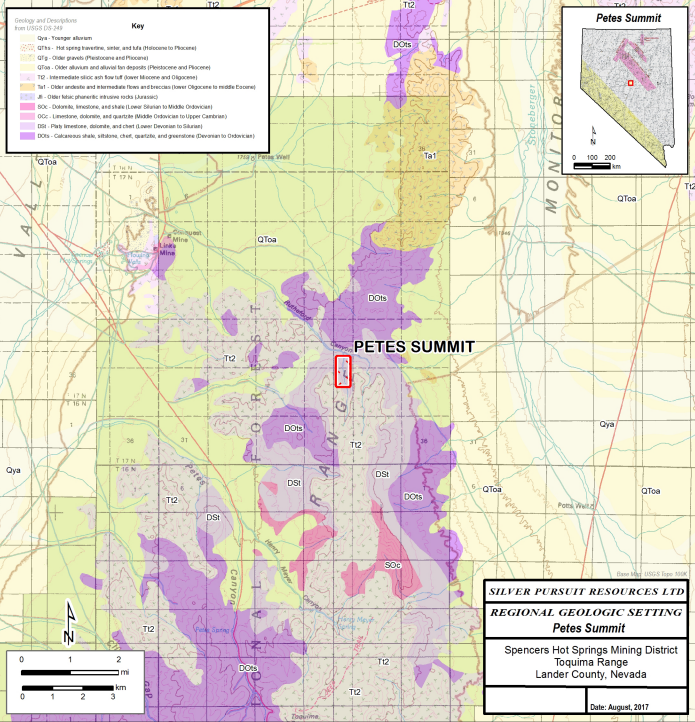 The oldest rocks at Petes Summit project are the “upper-plate”, Ordovician Vinini Formation. Detailed mapping has identified four subunits in the Vinini. The lowest “member” is a greenstone that occurs as rubbly outcrop near the thrust contact with the lower-plate, platy limestone. The greenstone member is made up of metavolcanic flows and sills (?) with characteristic propylitization of the mafic matrix and original plagioclase phenocrysts. Overlying the greenstone are three informal members; the lowest is the chert member and stratigraphically upwards, the sandy limestone and siliceous sandstone members. The chert member is comprised of poorly outcropping beds of light and dark gray chert along with lesser amounts of chert-pebble conglomerate, shales, siltstone and sandstone. The middle “member” is calcareous sandstone with carbonate and siliceous grains in a carbonate-bearing matrix. Locally, sandy limestone interbeds are present in the middle member and form persistent outcrops over several hundreds of meters in strike. The uppermost “member” of the Vinini Formation at the project is siliceous sandstone with subordinate siltstone and shale. The sandstone commonly forms lenticular outcrops that are suggestive of channel-type deposits. The lower plate of the RMT fault is Silurian-age, Roberts Mountains Formation. The poorly-outcropping unit is made up of platy-weathering, calcareous siltstone and silty limestone. Black chert and altered siltstone, interpreted to be near the base of the formation, are present on the claims and interpreted to be near the hinge zone of an anticline in the lower-plate rocks. Altered, Tertiary dike float occurs along the interpreted structural core of the antiformal structure. The Tertiary dike at the project exhibits hydrothermal alteration and is not present in outcrop, only in float. The map unit is fine-grained to weakly porphyritic and felsic to intermediate in composition. Float is tan to tannish-gray. 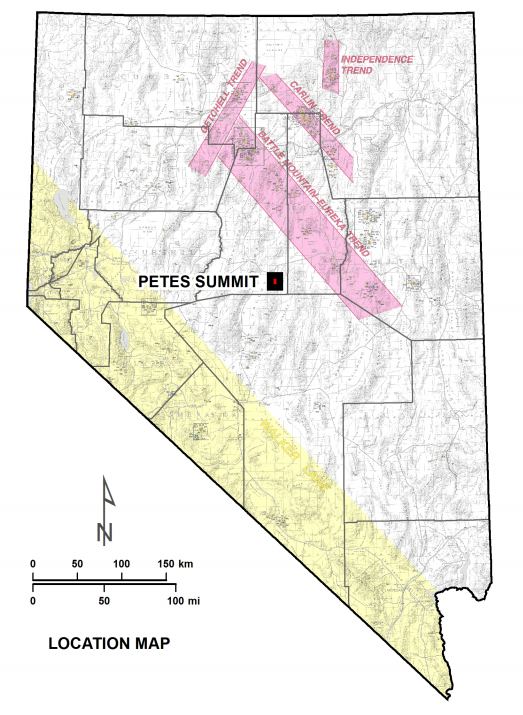 The composition, texture and alteration of the Tertiary dikes at Petes Summit is a common feature associated with Carlin-type gold deposits in Nevada. Post-mineralization map units at the project include felsic ash-flow tuff, older colluvium and younger alluvium. The tuff is correlated to the Miocene-age Bates Mountain Tuff (26.7 m.y.). The tuff is reddish-brown to gray weathering and typically crystal-poor. Fine phenocrysts of sanidine, plagioclase (? ), quartz and biotite are present. The unit is moderately to densely welded with well-defined collapsed and attenuated pumice fragments. Patches of colluvium are mapped at the project and are oddly lack clasts of lower-plate lithologies. The regional structure is defined by the Late Devonian development of the Roberts Mountains thrust (RMT) and later Tertiary extension and volcanism. The RMT is a large-scale feature that places deep-water, siliceous facies rocks in structural contact with footwall carbonate rocks deposited in continental-shelf and shallow-water facies. The RMT developed in late Devonian time during the Antler Orogeny. Typically, the thrust is not a simple structure and is demonstrated to occur with imbrication and to have complex folding both in the allochthonous rocks and the thrust itself by subsequent compressional orogenic events. During Tertiary time, extensional tectonics became the dominant structural style in the Great Basin. Basin and range development is the result of the Tertiary extension. Along with extensional tectonics, many calderas were formed in the region and resulted in (sometimes thick) broad areas of ash-flow tuff deposition. Continued extension beneath the Great Basin results in very deep valley fill subjacent to the pre-Tertiary rocks that make the ranges in the region. 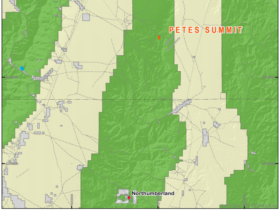 The nearest gold mines to Petes Summit are the Northumberland mine, 23 miles south, in the Toquima Range and the Quito (Austin Gold Venture) 23 miles west, across Big Smoky Valley in the Toiyabe Range. 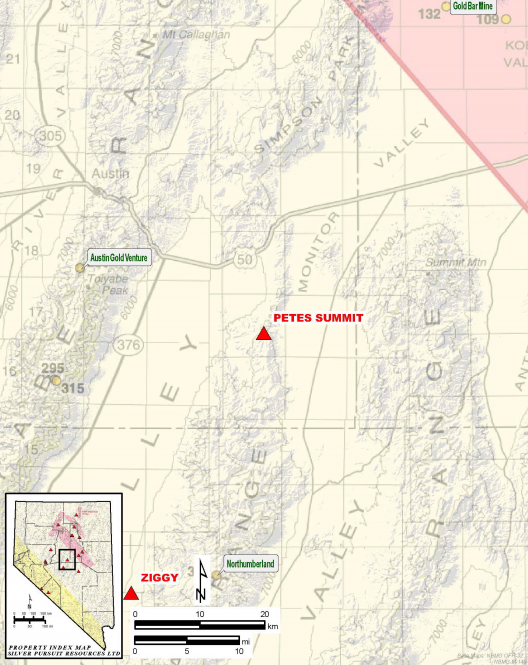 The structural settings of these mines are similar to the geologic setting at Petes Summit. Northumberland produced over 2 million ounces of gold and is hosted, in part, by the same geologic formations as the target beds at Petes Summit. At Quito, the original gold resources at Quito included approximately 315,000 ounces of gold from which approximately 175,000 ounces were mined in the late 1980s. 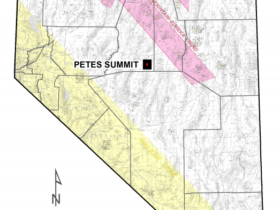 The best gold value, in rock chips, at the Petes Summit project is 0.354 g/t collected from altered Roberts Mountains Formation. Trace element geochemistry associated with sediment-hosted gold is present at the project and the high-gold sample has arsenic, antimony and mercury values of 760 ppm, 110 ppm and 25 ppm, respectively. The association of these trace elements in geochemical anomalies hosted in limey sedimentary rocks, low concentrations of base metals and altered Tertiary dikes is characteristic of Carlin-type gold mineralization. In addition to elevated trace elements noted above, barium values are also elevated with up to 3360 ppm. At the Northumberland mine, “late” barite veining is present with the gold mineralization. Zones of silicification are present as bedding replacement and as siliceous breccia zones. In the area mapped to date, silicification is not widespread and appears to be related to fault structures where not bedding-related. Samples with better gold values are commonly noted to have fine quartz veinlets present. Additional sampling should be completed in the northeast area where the lower plate rocks project beneath the pediment. 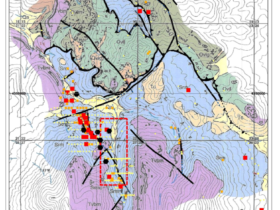 Special attention should be given to areas of weak geochemical anomalies included in previous sampling and the mapping should attempt to identify other intrusive rocks of the type present in the anomaly previously drill-tested. Geophysical surveys may be carried out to compliment mapping and sampling results.